Something to think about the next time you feel a little self-doubt. -A quote I read somewhere. I liked it a lot that I thought about it in the shower and you know when you shower and you get in a brainstorming mode? “I’m smart.” Sure there is a large – very large – number of people who are waaaaayyyyy smarter than I am but again that does not change the fact that I am what one might call knowledgeable. I like my body it’s nice I worked hard for this body. I like my hair it’s a really nice cut. I have a nice bag. I like the way I talk. The list goes on and on and it will always go on,But notice how it feels when you put the period right after. It feels awesome! Of course there are people who have it better but who cares about them? Stop thinking about them this is a you-time. i.e. someone who dresses better than you- you can get jealous and envy him/her or you could see what he/she does to look better then you can add what you learned to your style. Or when you meet someone smarter you can ask him/her what books they read or how they learned. You can also befriend them. That’s one of the best things you can do. 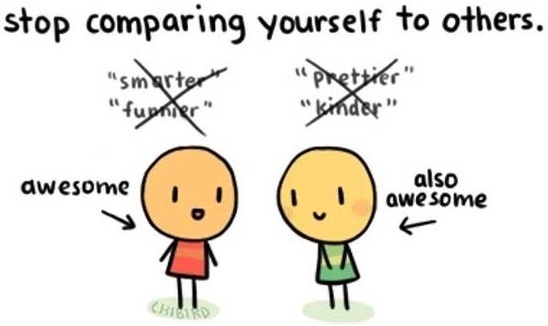 I’m pretty sure there’s only a few people who can be like you or better. You need to start by truly accepting yourself because no one will like someone who doesn’t like themselves. YOU! YOU! YOU! YOU! YOU! You’re important too! I usually forget about this whole thing but sometimes I remember it and I change what I can for the moment. I think it’s not about always having it on mind but remembering it when you need it. Say it again I”m handsome, I’m smart, I’m kind, I’m nice, I like my hobbies, I like the people I hangout with, I like the person I see in the mirror – I like myself better when I smile with my teeth showing. Now, it’s your turn to try it out. Where the Hell did Nutella Come From?